Newsreel Daily News / A Chronicle of the day 1969 № 21 The great feat of the people. Holiday of liberation and friendship. Kinoreportazh. Daily News / A Chronicle of the day 1969 № 21 The great feat of the people. Holiday of liberation and friendship. Kinoreportazh. Operators: Alekperov A., Gibov U., Leongardt U., Lichko A., Fedyaev E., Cheshev I. The celebration of Victory Day May 9 in Moscow, Sevastopol. Laying wreaths at the Tomb of the Unknown Soldier, a meeting of Veterans of World War II, celebratory fireworks. Solemn meeting of representatives of workers in Moscow, devoted to the 24 th anniversary of the liberation of Czechoslovakia by the Soviet Army from Nazi invaders. Present: Mikhail Suslov, the ambassador of Czechoslovakia to the USSR Lenart. Czechoslovakia, Prague. 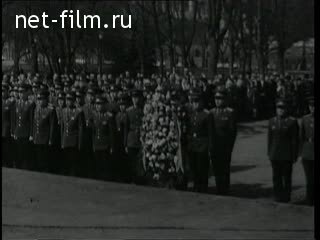 Visiting President of Czechoslovakia L. Freedom Day victory of the Central Group of Soviet troops; present: G. Husak, O. Cernik. Construction of the Soviet-Iranian Dam on the river Araks. Overlapping of the Arax River, construction of the reservoir. Operate Soviet and Iranian workers. Kazakhstan. North of rice fields on the farm "Voskhod" Chardara district of Shymkent area. Khabarovsk Krai. Hunter-Nanai PG Kiel catches in the taiga mink networks, delivers the furs to the receiving point. City of Moscow. The final match of the championship of the USSR national ice hockey team at the Luzhniki Sports Palace. Play hockey players commands "Spartak" (Moscow) and CSKA. Moments of the game. Winner of the match the team "Spartak" commits an honorary circle. 1. Victory Day on May 9 and 25 anniversary of the liberation of Sevastopol. Celebration in Moscow and Sevastopol. The laying of wreaths at the Tomb of the Unknown Soldier, a meeting of Veterans of World War II, celebratory fireworks. [_] 2. Solemn meeting of representatives of workers in Moscow, devoted to the 24 th anniversary of the liberation of Czechoslovakia from Nazi invaders. Present: Mikhail Suslov, the ambassador of Czechoslovakia to the USSR Lenart. Visiting President of Czechoslovakia L. Freedom Day victory of the Central Group of Soviet troops; present: G. Husak, O. Cernik. [_] 3. Construction of the Soviet-Iranian Dam on the river Araks. Overlapping of the Arax River, construction of reservoirs. Work Soviet and Iranian workers. [_] 4. North of rice fields on the farm "Voskhod" Chardara district Shymkent region, Kazakhstan. [_] 5. Hunters of the Far Eastern taiga. Hunter-Nanai PG Kiel catches in the taiga mink networks, delivers the furs to the receiving point. [_] 6. The final match of the championship of the USSR national ice hockey team at the Luzhniki Sports Palace. Play hockey players commands "Spartak" (Moscow) and CSKA. Moments of the game. Winner of the match the team "Spartak" commits an honorary circle.